The Asia Pacific Pharma Market which is the second largest after the North American market is predicted to cross $280 billion by the year 2021. In today’s rapidly evolving business landscape, pharmaceutical companies have shifted the focus from ‘Volume’ to ‘Value’ for increasing the quality of customer experience. With a gradual shift from product to the customer, the pharmaceutical industry is rapidly leveraging latest technology and value-based IT service providers to gain better outreach in the market. 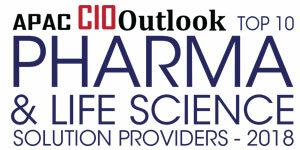 "With our experience thus far, we have continued to excel as a trusted technology partner for pharma and life sciences companies because we have constantly reinforced risk-based quality & compliance in all our software solutions & services"
Set against such a backdrop is Techsol Corporation, that is catalyzing the digital transformation of the pharmaceutical industry in three key areas—medical affairs, drug safety, and clinical development. At the forefront of pharma excellence, Techsol’s business is broadly divided into services and product development units. As a market leader in Asia Pacific region, Techsol’s service unit provides value-driven technology services with a commitment to increasing the operational efficiency of global pharmaceutical organizations. On the other hand, Techsol’s product development unit is responsible for developing purpose-built innovative software solutions to address specific unmet needs in the pharma industry. "We are constantly working towards expanding our solution portfolio to extend the depth and breadth of coverage in the existing and new process areas by leveraging new technology advancements such as AI, machine learning and NLP"
Being a highly regulated industry, taking advantage of emerging technologies such ascloud computing, artificial intelligence, robotics, blockchain, and others will fundamentally reshape various business processes involved in drug & device development by reducing time to market and addressing compliance challenges.In a nutshell, the objective behind the digital transformation of theindustry is to improve efficiency, uncover new business opportunities, and build a better relationship between patients and providers. With a mission to make a meaningful impact on patients’ lives, Techsol offers specialized and innovative software solutions and services for re-imagining how new medical treatments are discovered, developed, and delivered. Along with modern cloud solutions, the company offers services to understand client’s business challenges and resolve them with lean and risk-based congruent solutions fostering quality, speed, operational efficiency, and regulatory compliance. “Our vision is to become a pioneer in providing value-driven, high quality, process-oriented technology services and simplified business solutions for the pharmaceutical industry,” says Satya S S Sagi, founder and CEO of Techsol. The visionary behind Techsol’s innovative products and services is Satya Sagi, who has two decades of industry and domain expertise in the life sciences and pharmaceutical space. His rich knowledge in clinical development, drug safety, pharmacovigilance, and medical affairs led him to lay the foundation of Techsol. He is backed with a strong team of technical and functional domain experts and led by Sriram Varma, Vice President of Service Operations who has a strong business and technology background. Leveraging his experience over a decade in IT, Sriram specializes in the enterprise pharma systems implementation, validation, data migration, application integration, and offering systems support on cloud and on-premise platforms. “With our experience thus far, we have continued to excel as a trusted technology partner for pharma and life sciences companies because we have constantly reinforced risk-based quality & compliance in all our software solutions & services. However fast technology may change, our approach to address the business challenge and simplify the solution has been consistent by fostering continuous innovation,” said Sriram Varma. Techsol provides regulatory compliant cloud solutions to digitally transform clinical development, drug safety, and medical information management business processes in the pharmaceutical, biotech, medical device & healthcare industry. The company delivers a mature, audit-ready quality management system with relevant certifications, standards, data privacy, and protection. To enhance medical communications, Techsol developed a purpose-built, highly configurable next-generation medical information management system called “MedInquirer”. The solution supports pharma and contact centers for collecting, managing, and processing to reporting potential adverse events. The “Self-Service Portal” is another module of MedInquirer which allows healthcare professionals to interact with pharmaceutical companies about their products and access accurate online Medical Information about the company’s products. Along with the Self-Service Portal, Techsol offers MedInquirer Mobile app to allow booth agents to capture medical requests/adverse event/product complaint from health care professionals and consumers. For drug safety and signal management, Techsol delivers its comprehensive pharmacovigilance platform AccelSafety to enable unified collection, medical assessment, and regulatory reporting of clinical and post-marketing safety surveillance data. Built around the Oracle Argus Safety application, AccelSafety is delivered on a GxP compliant, fully managed cloud platform that allows biopharma and device manufacturers, along with small- and mid-size service providers, to manage safety data and make informed decisions keeping in mind the global compliance requirements. At the same time, AccelSafety increases the efficiency of individual case processing by bringing automation and integrated functionality to global-level operations. By providing a global safety database, the platform helps streamline safety processes and operations across the globe. "We are the most preferred strategic partner of Oracle health sciences, the world's largest pharma focused enterprise software company. Our configurable AccelSafety cloud solution is powered by Oracle Argus Safety and complemented with value-driven business services such as system integrations, validation, training & advanced data analytics are proven to reduce compliance risk and increase the quality of process outcomes for emerging biopharma in Asia Pacific.” said Sriram Varma. Techsol’s proprietary PVSentinel cloud solution enables proactive PV operations oversight and compliance governance. This configurable solution can streamline, track and report the outcomes of PV operations and cross-functional activities managed by different vendors, partners and affiliates. With Techsol’s CaseIRT—an advanced solution for automated intake, receipt, and triaging of adverse events using artificial intelligence methodologies such as machine learning & NLP. CaseIRT enables clients to maintain a single platform for capturing inquiries from multiple sources including affiliates, partners, medical information call centers, suppliers, and third-party systems. Clients find it easy to validate the authenticity and accuracy of each case to be marked for reporting by using in-built validation rules and duplicate search. Importantly, CaseIRT can be integrated with various systems to ensure timely reporting of adverse events and product complaint to maintain adherence to the various regulatory compliance. Techsol’s clinical development solutions include AccelClinical for Clinical Data Management and AccelCTMS for Clinical Trial Management. As a fully managed, cloud-based, and integrated solution powered by Oracle Health Sciences applications, AccelClinical allows clients to easily manage Case Report Form (CRF) design, study data collection, and data reporting across Phase 1 to Phase IV clinical trials. AccelCTMS is an integrated clinical trial management solution that provides holistic management of key clinical trial activities from study start to site close-out. AccelCTMS Plus has built-in risk-based monitoring capabilities on a GxP-compliant fully-managed cloud platform. Techsol also offers a horizontal platform for data warehouse and analytics called PRISM which is a powerful data engineering and analytics platform for advanced reporting and deriving valuable insights from disparate data sources to take informed and intelligent decisions across the pharma business process spectrum. Talking about the Services unit, Satya Sagi has great appreciation for his team’s consulting skills and the quality of deliverables prepared for different types of complex projects. The services team specializes in requirements analysis, system design, validation execution, and management of regulatory requirements as per the FDA, EU, and various global compliance standards. The team offers computer validation services for implementations, system or data migration, and application integrations. Clients can benefit from the ready-to-use validation kits for regulatory compliant applications, data migrations, and common system integrations including ERP and CMS. The company also excels at business process consulting, cross-platform system integration, legacy data migration, fully managed cloud services, pharma SaaS solutions development, and BI reporting and data analytics. The services unit, under Sriram Varma’s leadership, has successfully delivered several independent verification and validation projects utilizing industry best practices, including one for the third largest generic pharma company in the world. The client had acquired another generic pharma and selected Techsol to harmonize both the firms drug safety data on a global cloud platform. “We provide business-value to our clients by delivering high-quality configurable solutions & specialized services with the focus on quality and regulatory compliance. Our core pharma domain expertise was developed using our highly skilled experts through constant industry interactions, and by adopting industry best practices. For eg: All validation services we provide are in alignment to the GAMP5 risk-based validation framework. Our Service Desk operations are run by using the principles of ITIL and we deliver projects using the PmBOK methodology,” added Sriram Varma. As a technology company, it is pivotal for Techsol to adopt and utilize newer technology to improve the way it delivers its solutions today. The company has proven itself over the past few years in successfully delivering solutions on the cloud. Currently, Techsol is working with seven of ten top pharma companies in India and is running projects in Thailand, Singapore, Australia including the South Korean drug safety agency. With a lead in the APAC market, Techsol has established its corporate headquarters in the United States to serve clients in the North American region and has strategic direction planned for the European market. "We are constantly working towards expanding our solution portfolio to extend the depth and breadth of coverage in the existing and new process areas by leveraging new technology advancements such as AI, machine learning and NLP. Keeping up to speed with rapid advancements in technology requires considerable amount of dedication to reduce talent development time. Understanding the challenge and offering the right solution for clients with changing tech requirements is a key specialty for us because we have learned to thrive with agility,” says Satya Sagi. With the unprecedent rate of cloud technology adoption, Techsol is gaining recognition as a market leader in both the Asia Pacific & North American regions to transform pharma industry’s legacy business processes with fully-managed cloud solutions and value-driven business services.